Welcome to our Alexandria Monroe Township Historical Society! Alexandria is a small peaceful town in east central Indiana with lots of friendly folks and a genuine love for basketball. Located about 50 miles northeast of Indianapolis, our community is in the heart of the Midwest farmland and you don't have to drive very far to find lots of tomato, corn and soybean fields. During the late 1800's a natural gas boom hit Ohio and Indiana and Alexandria was right in the middle of things. Businesses and citizens enjoyed a prosperity never seen before. During World War II Alexandria was given the name Smalltown USA by the Federal Government because the community was a typical model of the small town in America. We wish to bring the histories to fulfill your personal appetite and needs. We will inform you of the contents of our Society Museum, display a variety of old photographs, make available local histories, genealogy information, announce our upcoming events and hours of operation. 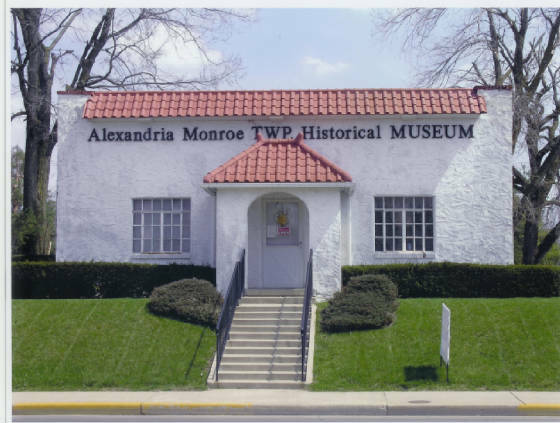 The Alexandria Monroe Township Historical Society was started in 1979 by John and Marsha Madden, Max and Nancy Draper, Curt and Rosemary Ellis, Jim Donahue and John Noffze. John Madden was the first president. 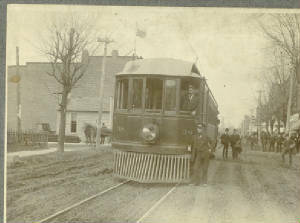 The Historical Society is located at 313 North Harrison across from the Cox'es Supermarket parking lot. We have a great collection of articles on display including Aladdin Lamps, and memorabilia from Lippincott Glass, Kelly Axe and the Union Traction Co. We have a large library with many research books from other states.